Our friend Alex was in town for the weekend. 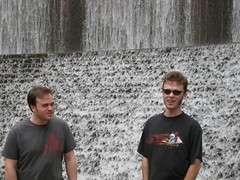 We had lunch at Yao's on Westheimer near Gessner and took goofy pictures at the Water Wall by the Galleria. I believe in this picture, Nick has done something questionable and Alex was confirming that it was indeed what he thought had happened.